Earlier this year, I let you know about big changes Hilton made to its award program, including eliminating their award chart. Without an award chart, it’s more difficult to know how many points you’ll need for an award stay. 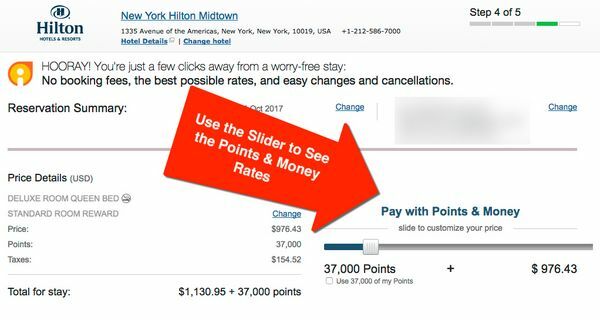 And because the AMEX Hilton cards are offering the highest sign-up bonuses ever right now, lots of folks are curious about how to use Hilton points. I’ll help you figure out how many Hilton points you’ll need per night! Through May 31, 2017, the AMEX Hilton Honors and the AMEX Hilton Honors Surpass cards have the highest sign-up bonuses ever offered for either card. You’ll earn 80,000 Hilton points with the AMEX Hilton Honors card, and 100,000 Hilton points with the AMEX Hilton Honors Surpass after meeting minimum spending requirements. Plus, the AMEX Hilton Honors Surpass now comes with a free weekend night after your first anniversary. That perk alone could be worth hundreds of dollars! With these great offers and recent changes to Hilton’s award program, it’s important to know how to figure out the number of Hilton points you’ll need for a free stay. Say you want to stay in New York City using your Hilton points. As an example, here’s how you’d check the number of points you’d need per night. To begin, log into your Hilton account. Just click “Sign In” from Hilton’s homepage. If you don’t login first, you’ll be asked to before the points rate will be displayed. Enter your travel details, including where you want to go and your travel dates. You can also select specifics like the number of rooms and the number of people in each room. Also, be sure to check the “Use Points” box to search for award rates. If you don’t know your travel dates, you can select the “Use flexible dates” box, too. From there, you’ll see a list of Hilton hotels at your destination, along with the nightly points rate of each hotel (unless it’s sold out!). 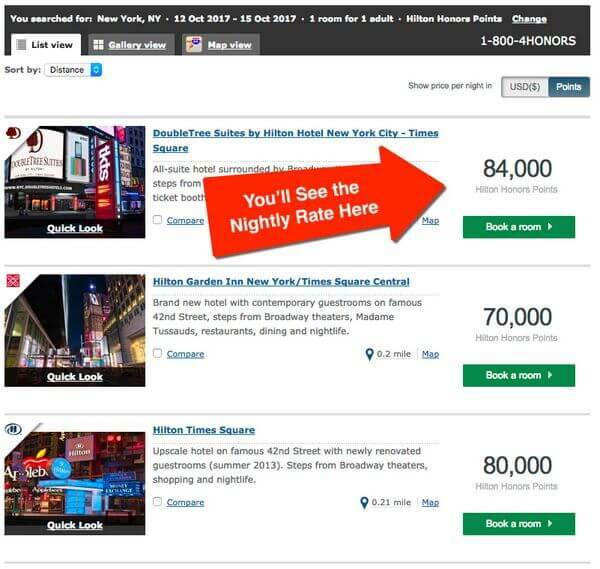 To choose a hotel, click the “Book a Room” button that’s under the nightly rate. You’ll then select the kind of room you want. Standard rooms will cost the least number of points, compared to upgraded rooms, like those with better views or more space. For example, nights at the New York Hilton Midtown standard room in October 2017 go for 80,000 Hilton points per night. But a “premium” room with views of New York City costs 137,000 Hilton points per night. Or more if you want breakfast included in your stay! 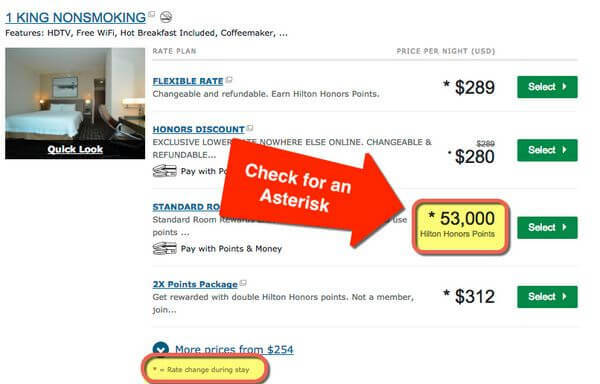 And if you see an asterisk next to the nightly rate, it means the rate changes during your stay. I saw this when I searched for a 4-night stay at the Hampton Inn San Francisco Downtown/Convention Center in late October 2017. Step 5. Book Your Room! After deciding which room you want, click the “Select” button. From there you can continue booking as usual. 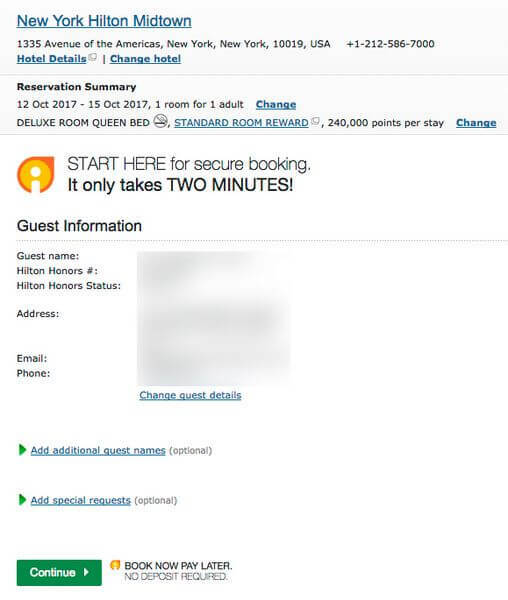 You’ll see your reservation details and your Hilton loyalty account information. You can even decide if you want to use a combination of cash & points. It’s a simple process. But it’s still inconvenient to have to check the rate every time you book a Hilton hotel. Because without an award chart, the rate could change depending on the day of the week or season. Hilton recently got rid of their award chart, and it’s trickier to figure out how many points you’ll need for a stay. So I put together this step-by-step guide that shows you how to figure out the nightly rate for any Hilton hotel. And luckily, the process isn’t too complicated. Hopefully it’s helpful for folks looking to make the most of the limited-time AMEX Hilton card offers! Hi, you definitely do not need to log in to see the points rate displayed, so step 1 can be skipped completely. Thanks for the article, though! Thanks. I recently booked Hilton in Barcelona using points, however I booked for 2 adults, but also have my 2 kids traveling with us, do you foresee that being an issue?